Million dollar dreams are being crushed by the sword. 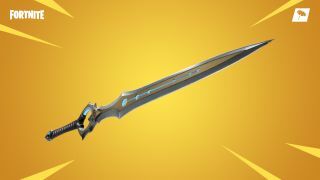 Fortnite’s Infinity Blade popped into existence yesterday, killing people in a single hit, destroying buildings and bestowing anyone carrying it with regenerating health. It’s devastatingly powerful, much like Thanos’ Infinity Gauntlet, and its inclusion during the Winter Royale tournament has created chaos. It’s been a joy to watch, but some players are less than pleased. The Infinity Blade is not a balanced weapon. Only one spawns per match and it turns players into nearly unstoppable killing machines. It’s like playing with a WMD while everyone else just has scissors. That’s the appeal—it’s wild and absurd. It’s a lot of fun, and while that’s good for the game in general, it is apparently less welcome in a competitive setting like the Winter Royale. The timing seems strange, especially when the EU qualifiers didn't feature the sword, but every player in the tournament is also in the same boat. Any of them can lose to a sword-wielding maniac, just like any of them can lose from being shot in the head by a hidden enemy. And as frustrating as I’m sure it is to lose a potentially huge payday just because someone snatched a weapon before you could, it’s a lot more entertaining from the spectator side of the competition. Competitive Fortnite has never been so much fun to watch. There’s an argument that the sword should have been locked away in a limited time event, not unleashed on the standard mode and tournament, but where’s the fun in that? Death to balance!